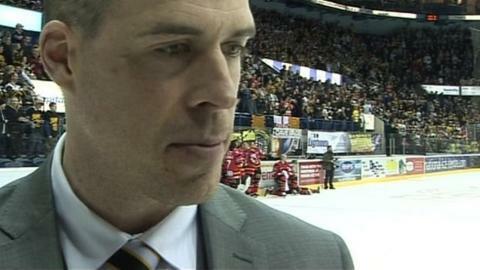 Nottingham Panthers forward Chris Lawrence says he is excited to be playing for coach Corey Neilson again. The 28-year-old, who scored 63 points for the Panthers last season, has already played for Coventry Blaze and Sheffield Steelers this year. Lawrence told BBC Radio Nottingham: "He's not shy to give me a hard time. I'm sure we push each other's buttons. "He helped me out last year and we got on well by the end of the season. I am excited to be a student of his again." Lawrence started the season with Coventry after not returning to the National Ice Centre in the summer. After being released by the Blaze, he was then picked up by Sheffield where he scored 14 points in 17 games. But last week he parted company with the Steelers and was picked up on a short-term deal by his former club. "I was happy with my season last year and want to duplicate what I did last year, for the short time that I expect to be here," added Lawrence.